A 30ml vial or a 1 litre tube containing 25 Cryptolaemus montrouzieri adults with a feeding strip. Cryptoleamus adults and larvae are predators of Mealy Bugs (Pseudococcus sp.). Mealy bugs are important pests of indoor plants, many ICM crops and in organic salad crop production. Cryptolaemus montrouzieri is a Coccinellid predator, which is used widely in Southern Europe where it is naturally endemic, for the control of Mealy Bug pests on citrus and other tree crops. 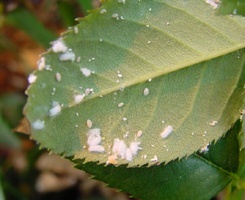 In Northern Europe it has been used commonly for release onto indoor ornamental plants as a population regulator for Mealy Bugs. The large white cottony larvae of Cryptolaemus should not be confused with its host, which also has hairs and a creamy white colour. 0351-01 cryptoline m. Cryptolaemus montrouzieri, Adults 25 unit size.